via Scientists cure cancer, but no one takes notice — Health & Wellness — Sott.net. Received 18 December 2007; Revised 28 April 2008; Accepted 4 July 2008; Published online 2 September 2008. “The unique metabolism of most solid tumours (aerobic glycolysis, i.e., Warburg effect) is not only the basis of diagnosing cancer with metabolic imaging but might also be associated with the resistance to apoptosis that characterises cancer. The glycolytic phenotype in cancer appears to be the common denominator of diverse molecular abnormalities in cancer and may be associated with a (potentially reversible) suppression of mitochondrial function. This patent application claims priority from U.S. Provisional Patent Application No. 60/669,884 filed Apr. 11, 2005, the content of which is hereby incorporated by reference herein. The invention relates to the use of dichloroacetate and obvious chemical equivalents thereof in the treatment of cancer. Related uses and diagnostic and screening methods are also included in one aspect of the present invention. Most cancers are characterized by a resistance to apoptosis that makes them prone to proliferation and resistant to most cancer therapies. Most of the available cancer treatments aim to induce apoptosis but are highly toxic. There are two main categories of apoptosis: the receptor-mediated and the mitochondria-dependent apoptosis. Mitochondria-dependent apoptosis is not very well studied and only recently have the mitochondria been viewed as anything more than an organelle that produces energy. As such there is a need for a cancer therapy that can overcome apoptosis resistance in cancer cells. A cell can become resistant to apoptosis in a variety of ways one of which is altering its metabolism and having hyperpolarized mitochondria. Since apoptosis is initiated by depolarization of mitochondria, the more hyperpolarized a mitochondrion is, the further it is from the depolarization threshold and the more resistant it is to the initiation of apoptosis. In one embodiment the present inventors have surprisingly found that one can modulate mitochondrial function to treat cancer. In one embodiment, the present invention provides a method for inducing apoptosis in cancer. In another embodiment, the inventors provide a method for inducting apoptosis in cancer but normal cells. In another embodiment, the invention provides a method of reversing apoptosis resistance in cancer cells, such as cancer cells with hyperpolarized mitochondria. In one embodiment, the method comprises administering to cancer cells, in one embodiment cells having or suspected of having hyperpolarized mitochondria, an effective amount of dichloroacetate or salts thereof or obvious chemical equivalents thereof. In one embodiment, the dichloroacetate or obvious chemical equivalent thereof is administered in combination with another pro-apoptotic agent and/or chemotherapeutic agent, and/or other cancer therapy. In one embodiment, the invention provides a method for inducing apoptosis and/or reversing apoptosis resistance in a cancer cell, comprising administering to the cell an effective amount of dichloroacetate or obvious chemical equivalent thereof. In another embodiment, the invention provides a method for inhibiting proliferation of cancer cells, comprising administering to the cells an effective amount of dichloroacetate or obvious chemical equivalent thereof. In another embodiment, the invention provides a method of decreasing survivin in a cancer cell, comprising administering to the cell an effective amount of dichloroacetate or obvious chemical equivalent thereof. In another embodiment, the invention provides a method of increasing Kv1.5 protein in a cancer cell comprising administering to the cell an effective amount of dichloroacetate or obvious chemical equivalent thereof. In another embodiment, the invention provides a method of increasing AIF in a cancer cell comprising administering to the cell an effective amount of dichloroacetate or obvious chemical equivalent thereof. In another embodiment, the invention provides a method of increasing H 2 O 2 in a cancer cell comprising administering to the cell an effective amount of dichloroacetate or obvious chemical equivalent thereof. In another embodiment, the methods of the invention cancer cells, but not normal or non-cancerous cells are affected by the treatment with dichloroacetate or obvious chemical equivalent thereof. In one embodiment, the present invention provides a method for treating a cancer. In another embodiment, the invention provides a method of treating a cancer associated with hyperpolarized mitochondria. In another embodiment the invention provides a method of treating cancer by restoring mitochondrial membrane potential (ΔΨm) (essentially depolarizing the hyperpolarized cancer cell mitochondria). This molecular metabolic therapy is accomplished by administering to a patient in need thereof a therapeutically effective amount of dichloroacetate or obvious chemical equivalent thereof. In another embodiment, the invention provides a use of dichloroacetate or obvious chemical equivalent thereof in the treatment of cancer. In one embodiment, the dichloroacetate is a salt of dichloroacetic acid. 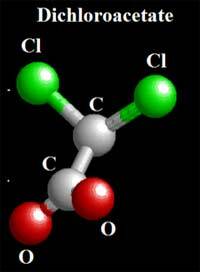 In another embodiment, the dichloroacetic acid is a sodium salt of dichloroacetic acid. In one embodiment, the cancer to be treated using the DCA or obvious chemical equivalent thereof is selected from the group consisting of: non-small cell lung cancer, glioblastoma and breast carcinoma. In another embodiment, the dichloroacetate, or obvious chemical equivalent thereof, is administered in the form of a pharmaceutical composition comprising dichloroacetate or obvious chemical equivalent thereof and a pharmaceutically acceptable carrier. In yet another embodiment the invention provides a use of dichloroacetic acid or dichloroacetate or obvious chemical equivalent thereof in the preparation of a medicament or pharmaceutical composition for the treatment of cancer, such as a cancer associated with hyperpolarized mitochondria. In yet another embodiment, the dichloroacetate, or obvious chemical equivalent thereof, is administered orally. In yet another embodiment, the dichloroacetate is administered in a water-based formulation. In one embodiment the water-based formulation of DCA comprises 0.0075 g of DCA/l to 7.5 g of DCA/l). In another embodiment the dichloroacetate or obvious chemical equivalent thereof is administered at a total daily dose of ˜25-50 mg/kg bid of dichloroacetate. In another embodiment the dose is 10-100 mg/kg given twice a day is administered to the patient. In one embodiment the dose is 25-50 mg bid. In another embodiment, the invention constitutes a method for determining whether a cancer is associated with hyperpolarized mitochondria, which would predict its therapeutic response to dichloroacetate or obvious chemical equivalents thereof or similar compounds. In one embodiment such method comprises administering an effective amount of dichloroacetate, or chemical equivalent thereof to a cancer tissue sample from a patient and measuring its apoptosis sensitivity and mitochondrial membrane potential using confocal microscopy or flow cytometry. This diagnostic test would determine whether the individual patient could benefit from dichloroacetate or other therapies that cause apoptosis through similar mechanism.